One tasty combination and very popular among people in the city of Banda Aceh: a mixture of coffee and sweetened condensed milk. A variant of café latte? Not really. I’d rather call it milk coffee instead. 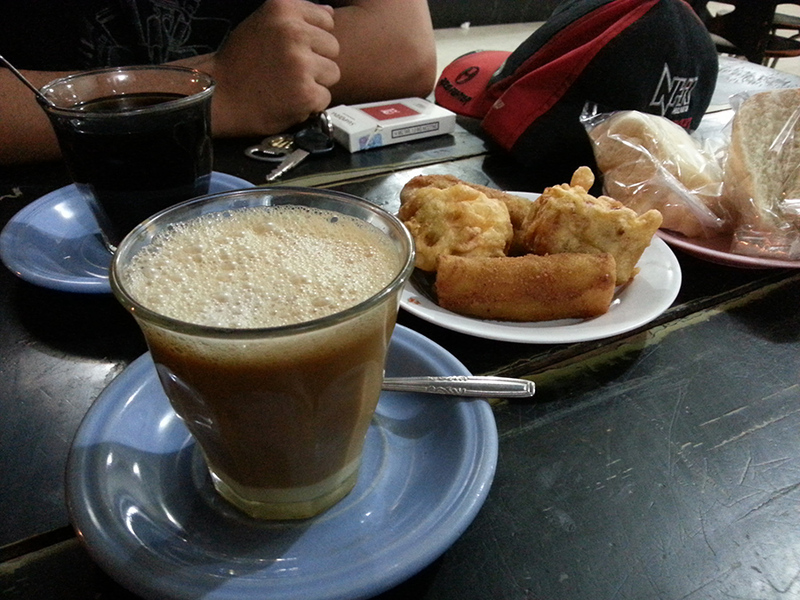 But still, in Banda Aceh there are two variants of such coffee + sweetened condensed milk. The first one is a regular milk coffee with a composition of 3 to 1 between coffee and milk, while the second is a mixture of coffee with a composition of less condensed milk. The coffee must also be the coffee filtered with a typical Aceh coffee barista filter, not using a coffee machine, or other usual coffee filter we normally find at other places..
Sanger coffee (kopi sanger), that’s how Banda Aceh residents call it. This one is really unique, very different from other coffee mixture in other places. Its unique taste is derived from a mixture of filtered coffee using an ‘Aceh coffee filter’ stretched high by the barista, and then shaken until it is foamy, with sweetened condensed milk that is only about a fifth of a portion compared to the coffee. Thus, the taste of sanger coffee is not too sweet when it’s compared with the usual milk coffee. Because it’s using less milk and the coffee itself is also the result of a coffee filter (the ground coffee powder can be used few times), the price of this sanger coffee is considerably cheaper than an espresso or the usual milk coffee. And actually that was indeed the original purpose. According to a coffee shop owner where my cousin and I stopped by in Banda Aceh, sanger coffee was originally created in the 90s for the ‘thin pocket’ students who also wanted to enjoy milk coffee at the coffee shop. As a result, coffee shop owners began to create cheap versions of milk coffee for those students. Sanger itself reportedly comes from the abbreviation of ‘sama-sama ngerti’ (understanding each other, in this case between the students and the coffee shop owners), which then continue to be used as the name of the coffee created as the outcome of a mutual understanding between the coffee shop owners and the students..
Have a cup of sanger coffee with snacks, and you’ll find it hard to stop craving for another one..
← Banda Aceh: A Tsunami Recovery Story..